Stop the NT Intervention – Sorry means you won’t do it again. 9 am LaPerouse point, Bunnerong rd for the walk against racism to join the Redfern rally. 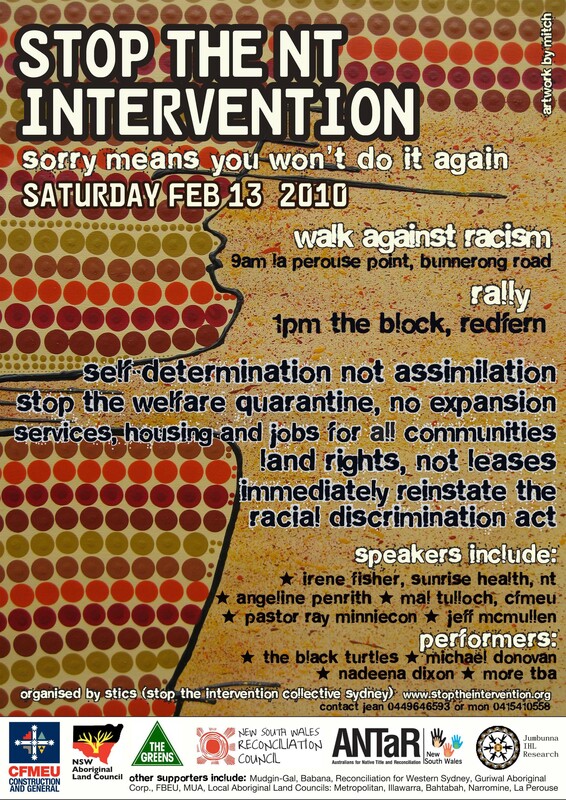 On February 13, 2010 there will be a national day of action against the NT Intervention and for Aboriginal rights. This will mark the 2nd anniversary of the Apology to the Stolen Generations, when Prime Minister Rudd committed the government to, “a future where this Parliament resolves that the injustices of the past must never, never happen again”. But ongoing NT Intervention policies reek of the same paternalism and commitment to assimilation that created the Stolen Generations. The Intervention has been a $1.5 billion disaster. The government has taken control of Aboriginal lives and land – but has not yet built a single house. Shamefully, communities will not receive housing until they sign 40-year leases over their land. This policy is expanding nationally. The income quarantine is leading to greater poverty and social dislocation. Government statistics show reports of domestic violence are up 61%, substance abuse up 77% and 13% more infants have been hospitalised for malnutrition. Minister Macklin has said the suspension of the Racial Discrimination Act has “denied dignity” to Aboriginal people. But her changes to Intervention legislation will see the RDA suspended until December 31, 2010. Rather than do away with failing policy, new legislation will allow the compulsory welfare quarantining to be extended to “areas of disadvantage” around the country. This will start across the NT from July 2010. Draconian measures such as compulsory acquisition of Aboriginal land and extreme police powers have been rebadged “special measures” under the RDA. Racism is not a special measure. 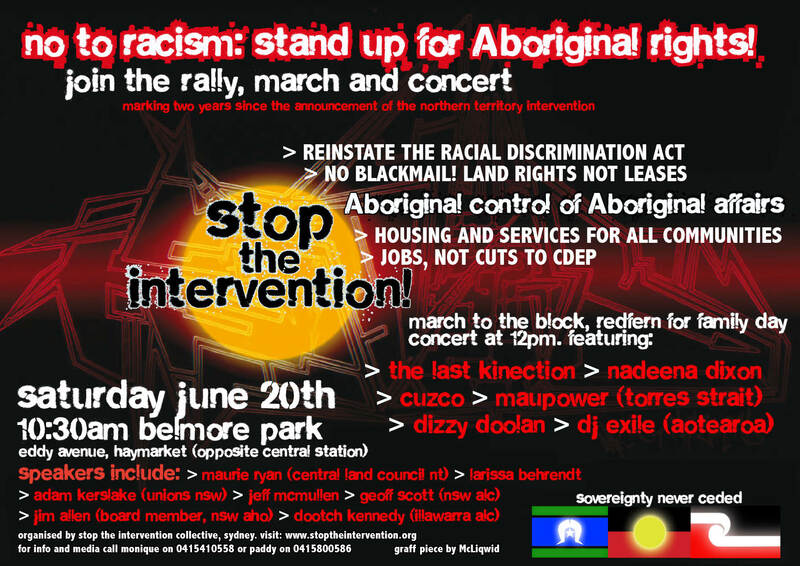 The demonisation of Aboriginal people at the core of the Intervention is leading to increased racism across Australia. Indigenous incarceration rates have risen 10% in the past year. Juvenile detention now stands at 30 times the national average. Aboriginal organisations everywhere face aggressive mainstreaming. Aboriginal people have consistently demanded an end to the NT Intervention measures and resistance is growing. Turning around the unacceptable disadvantage facing Aboriginal people requires massive increases in resourcing of community controlled organisations – not more racist laws. Goodooga, northwest NSW, 23 January 10 – – In this year of a federal election, Prime Minister Kevin Rudd and his Labor Party had better be prepared to talk to the Aboriginal Nations, or face a tsunami-type backlash, says the convenor of an Aboriginal summit in Canberra from the 30th of January to the 1st of February. “We will not lie down and take it anymore,” Michael Anderson writes in a media release. The summit is open to the media and Mr Anderson says SBS Radio, the National Indigenous Radio Network and national Aboriginal TV have indicated they’ll cover it. Proceedings will also be streamed live on the internet. Mr Anderson calls on elders and youth to find solutions to problems created by Great Britain and “maintained by the colonial state of Australia”. – and the list goes on. “We are and continue to be sovereign independent Aboriginal nations; the land is ours and always will be. The wealth that has been extracted from the land does not help Australia and we, the traditional owners, get poorer and are forced to live on the state’s welfare system. In this year of a federal election Prime Minister Kevin Rudd and his Labor Party had better be prepared to talk to us, the Aboriginal Nations, or face a tsunami-type backlash. The rise of racism; attacking the poor through Minister Jenny Macklin’s welfare quarantining; using children as a way of winning the hearts and minds of the Australian public so as to justify their assimilation policy of forcibly removing children from their families; shutting down most of the self-determined Aboriginal programs; using government-nominate d and -approved Aboriginal collaborators to impose their will through the so-called Aboriginal advisory panels represents the work of troubled and desperate administrators; to continue to use police to daily terrorise our children on the streets is a criminal act of the state; to police Aboriginal communities through a programme to make Aborigines fear authority are the actions of a dictator state; to maintain an operation of welfarism to control the lives of the Aboriginal people is the also the act of a dictatorship; removing children and giving them to non-Indigenous people to raise without their Aboriginal heritage and language is an act of genocide by the state; to deny Aboriginal land rights is a continuation of British colonialism – and the list goes on. We are and continue to be sovereign independent Aboriginal nations; the land is ours and always will be. The wealth that has been extracted from the land does not help Australia and we, the traditional owners, get poorer and are forced to live on the state’s welfare system. The ‘New Way’ summit I have convened to Canberra from the 30th of January to the 1st of February is a call to our elders and youth to find solutions to problems that have been created by the foreign state of Great Britain and are maintained by the colonial state of Australia. If the Australian public truly wants us to bridge the gap and address the disadvantages, then I call upon and urge all people who call themselves Aussies to stand behind us and help us get the message across to those whom you elect to give us a voice and let us deal with the issues that state and federal governments know are of their doing. The Australian public have always trusted in the words of the governments that what they were doing was in the best interest of the Aborigines, but the public have no idea of the pain and suffering that we have to continue to endure. The dysfunctionalism that permeates through our communities cannot be dealt with through bricks and mortar alone. We know who we are and from this day forth there will be no words such as Aboriginal or Indigenous, for I am a Euahlayi Dthane, a Black man of the Euahlayi Nation through my mother. Through my father I am a Gumilaroi Murri. This is what we now need to tell the state leaders of this country and we need to demand that when they talk of our issue and our nations they need to identify who and what nation they talk of. This must be a demand that we stand by. As the leader of my nation, the Euahlayi of north-western New South Wales and southern central Queensland, and as the convener of this New Way Summit, I call upon the Prime Minister, Kevin Rudd, once again to take notice to this summit, for it will lay the foundation for the confrontation that Australians constantly say they never. The spirits of our ancestors, who fought the white man, are always with us as we have gone from one fight to the other. They are always reminding us that blood was shed every year since the British invasion of our ancestral lands. No Australian history wants to talk of this but we will now remind them that we have survived and we will fight and Australia needs to be aware of the anger that is inside many of our pre-existing diverse nations. Using the divide of full-blooded Aborigines against the Aboriginal castes has been the backdrop for division as was devised by the governments and their advisors, but do not count on this anymore, for we all share the same shocking history of white oppression and rule over our lives and the way we have done business since the coming of the white man. This will end at this New Way Summit. We will not lie down and take it anymore. Outcomes of all discussions at the summit will be available for perusal and comment every day atwww.wgar.info. Live streaming will be accessible at http://www.ustream. tv/channel/ wgar. Michael Anderson can be contacted at 02 68296355 landline, 04272 92 492 mobile, 02 68296375 fax, ngurampaa@bigpond. com.au. June 20, 2009 will mark two years since the Howard government announced its Intervention into NT Indigenous communities. The Intervention promised health, housing and education – but it has delivered only racism, the destruction of Aboriginal control and worsening social problems. After the allocation of more than $1 billion the only houses that have been built with intervention funds have been for government managers imposed on communities. The compulsory quarantine of welfare payments is causing greater poverty, real hunger and segregation in Centrelink and in shops. The Rudd government has made symbolic gestures to try and signal a break from the racism of Howard – apologising to the Stolen Generations and recently signing on to the UN Declaration on the Rights of Indigenous Peoples. But this is hypocrisy. They have pursued Howard’s agenda of “mainstreaming” and assimilation with force, expanding the Intervention, despite the recommendations of their own ‘review’. In the NT, they have also overseen the withdrawal of funding from remote ‘outstations’, forcing migration into towns, and severe restrictions on teaching in Aboriginal languages. The government has pledged to re-instate the Racial Discrimination Act this spring, but has insisted this will mean no ‘softening’ of punitive Intervention policies. A key aspect of the Northern Territory Intervention has been the compulsory acquisition of Aboriginal township land for five years. Housing assets have been forcibly transferred from community councils to the NT public housing agency. Over the past nine months, the government has announced that only 16 of the 73 ‘prescribed communities’ will receive any funding for new housing. And these communities have been given an ultimatum. They must sign township land over to the government for between 40-90 years before any construction can commence. While a handful of communities-desperate for housing and under extreme pressure-have signed these leases, the majority say they will never sign away Land Rights fought for over decades. In March, the government announced it would extend the policy nationally – no new housing will be built in any remote community across Australia unless long-term leases are signed. And of the scores of Aboriginal communities in NSW who desperately need housing, only two – Walgett and Wilcannia – will receive funding. The abolition of Aboriginal controlled Community Development Employment Projects (CDEPs) was a cornerstone of Howard’s Intervention, forcing thousands of Indigenous people in the NT out of work. Now this policy is also being rolled out nationally, with up to 30,000 CDEP jobs facing the axe this July. In the face of looming global recession this is madness. We need to fight these policies aimed at breaking up Aboriginal control and forcing Aboriginal people to leave their communities. June 20 will be a national day of action, including a march in Darwin led by Aboriginal people living under Intervention policies. Join in the rally, march and concert in Sydney. Demand an end to Rudd’s racism and funding now for Aboriginal controlled housing and services in all communities. On 24 May 2009 the Minister for Indigenous Affairs announced the Australian Government is taking steps towards compulsory acquisition of the Alice Springs town camps ‘to give children in the camps a better chance at a safe, healthy and happy life’. The Minister described the conditions in the camps as appalling, referring to acute overcrowding, sub-standard housing, alcohol abuse, despair, hopelessness and horrific crimes. The Minister announced intentions to implement a comprehensive plan to transform the town camps and provide intensive support services. We strongly oppose the proposal by the Government of Australia to compulsory acquire leases over Aboriginal and Torres Strait Islander lands or territories without their free, prior and informed consent. We call upon the Government of Australia to comply with its international obligations to respect the rights of the Indigenous Peoples of Australia by ensuring that the representatives of the Aboriginal people in the region of Alice Springs are able to make an informed decision regarding the provision of adequate housing and services for their populations. Specifically, we urge the Australian Government to re-open negotiations with Tangentyere Council, in concert with other relevant representative Aboriginal organizations, and facilitated by the Australian Human Rights Commission, with a view to concluding as soon as possible an agreement for urgent funding for suitable housing to meet the needs of the Aboriginal people of the region. We ask the Australian Government to withdraw their decision to compulsory acquire the lands held by the Tangentyere Council. In regards to the international obligations of the Australian Government we note the following paragraphs regarding the rights of Indigenous Peoples and relevant recommendations by the human rights mechanisms of the United Nations and international human rights treaty bodies. The Declaration on the Rights of Indigenous Peoples was adopted two years ago by an overwhelming vote of the UN General Assembly. Australia was one of only four governments to vote against the adoption of this universal Declaration but on 3 April 2009 the Government announced its support for the Declaration. In May 2007, following a visit to Australia during 31 July to 15 August 2006, the UN Special Rapporteur on adequate housing as a component of the right to an adequate standard of living, recommended to the United Nations in Paras 98 and 135 of his report that Aboriginal people should be given control to the greatest extent possible of our affairs and expressed his particular concern that removal of Aboriginal people as decision makers over the use and access of the land in the Northern Territory would undermine the right of self-determination. He advised that such action ‘may call into question Australia’s obligations under the International Covenant on Economic, Social and Cultural Rights, including its provisions on self-determination’ . On 13 March 2009, the Committee on the Elimination of Racial Discrimination (CERD) wrote to the Australian Government expressing its concern that the Racial Discrimination Act was suspended in the Northern Territory and calling for a report to the Committee by 31 July 2009 on the progress made in redesigning its (the Government’s) approach in the Northern Territory in consultation with the Aboriginal communities. On 2 April 2009, the Committee on Human Rights released its findings on Australia’s obligations under the International Covenant on Civil and Political Rights. The Committee expressed its concern with the Northern Territory Emergency Response measures and particular concern about the negative impact of the measures on the enjoyment of the rights of indigenous peoples and at the fact that they suspend the operation of the Racial Discrimination Act 1975 and were adopted without adequate consultation with the indigenous peoples. We also appreciate that the Australian Government has presented to this session of the Permanent Forum on Indigenous Issues a joint statement with our delegations expressing a desire that Australia meet its human rights obligations, and we recognise that a critical factor in achieving this goal is the degree to which Aboriginal and Torres Strait Islander peoples can set the agenda, and affect policy and service delivery. Our delegations are encouraged by the Australian Government’s decision to support the UN Declaration on the Rights of Indigenous Peoples. Therefore, in conclusion to this statement, we support the view that the Government of Australia should establish and implement in conjunction with the Aboriginal and Torres Strait Islander peoples a fair, independent, impartial, open and transparent process to adjudicate the rights of the Aboriginal people in relation to our lands. This provision is stipulated in Article 27 of the Declaration on the Rights of Indigenous Peoples. We strongly recommend that the Australian Government provide, as a matter of priority and urgency, extensive human rights training on how human rights apply to Aboriginal and Torres Strait Islander peoples in the areas of non-discrimination and civil, political, economic, social and cultural rights. The training should target all sectors of society, but particularly it should target State officials having a direct role in engagement of the Aboriginal and Torres Strait Islander peoples and the judiciary. Rally, Saturday, 14th February 2009, 10:00 a.m. Gather at the fence line 10:00 a.m.
Whose Son, Brother, Sister, Cousin, Uncle, Aunt will die this year at the hands of the police? Support Aboriginal Rights – Get on the bus to Canberra! 1. Rally for Opening of Parliament: February Tuesday 3rd 12pm. 2. Join activists from around the country in workshops at Aboriginal Tent Embassy February 1-2. A bus from Brisbane will leave Saturday 31st January at 1pm to take people to Canberra for the national convergence to be held at the Aboriginal Tent Embassy from the 1st – 3rd of February. Seats on the bus are $60 negotiable – to book on the bus call Lauren on 0413 534 125. 2. Join activists from around the country in workshops and campaign discussions. There will also be a public forum on the Monday night in Canberra: The NT Intervention – Living with a Racist Policy. 7pm Monday February 2 Albert Hall, Commonwealth Ave, Yarralumla, Canberra. Speakers include: Barbara Shaw – Mt Nancy Town Camp, Mparntwe – Alice Springs, Harry Jakamarra Nelson – Yuendumu community, Elaine Peckham – Iwupataka Land Trust, George Newhouse – Human Rights Lawyer, Jon Altman. Aboriginal Rights Coalition members are joining people from around the country to converge and camp at the Aboriginal Tent Embassy on the lawns of Old Parliament House. Convergence organisers have arranged porta-loos and marquees, and the “Chai tent” will be providing some food for a donation. But campers are asked to bring some snacks. Busses of people from prescribed areas in the NT are costing $20,000. On top of that, hire of a cool-room to allow food at the Tent Embassy, and porta-loos, sound systems and marquees are costing at least another $8,000. (Please include your name in the deposit so we can keep track of payments, and send an email for confirmation. If you’re transferring online don’t forget the three letter abbreviation for the account which is MEL). Include your name or organisation in the deposit description if you wish to be identified. – Recognise the culturally autonomous Torres Strait Islander and Aboriginal Nations of the Australian continent and immediately end the one-size fits all approach to Indigenous affairs. Consult with communities and nation groups independently in order to develop policy in partnership with sovereign cultural law and practice. – Full welfare rights for all. End the punitive welfare quarantine. Aboriginal Australia still waits for human rights. Aboriginal people are 13 times more likely to be in prison than non-Indigenous Australians and horrific deaths in custody continue, as highlighted by recent events on Palm Island. Aboriginal babies die at more than twice the rate of the non-Indigenous population. The Stolen Generations still wait for compensation. Land rights are under increasing threat by mining companies and waste dumps and by the government’s push for leases to remove community control over community land. Labor has not adopted the UN Declaration on the Rights of Indigenous Peoples. Yet the Rudd government says the Racial Discrimination Act will remain suspended and a blanket welfare quarantine will be maintained for at least the next year. An Intervention that relies on the suspension of the very Act designed to protect people from racism, makes a mockery of any claim that it is for the benefit of Aboriginal people. “For old people the intervention is bringing up bad memories of the past, the old days, the ration days, the dog tag days and the mission days” (Women’s statement from the inaugural Prescribed Area People’s Alliance, 29 September 2008). Under the Northern Territory Emergency Response (NTER), leases and government business managers have been imposed on prescribed communities. The only houses built with Intervention funds have been for the business managers, many of which are unoccupied. Only a handful of ‘prescribed’ communities have been offered funding for housing – and only if they lease their land to the government for 40, 60 or even 90 years. Many communities, deemed “unviable” will be denied funding and basic welfare rights. Successful programs run by local communities dealing with issues of alcohol abuse, domestic violence and education, have been dismantled as the NTER has taken bureaucratic control. The recommendations of the “Little Children are Sacred” report are being ignored. Yet the NT government has announced a ban on the teaching of Aboriginal languages in schools for all but one hour in the afternoons. This approach – of open assimilation and “mainstreaming” is being rolled out across Australia. Koori schools in Victoria are being closed by the state government. Community Development Employment Projects (CDEP), a crucial source of support for Aboriginal communities and employment for thousands of families, are being threatened with closure nationally. People are facing the prospect of having to leave their communities in order to access employment and basic welfare rights. communities literally rely on the uncertain delivery of food parcels. Others are left with no money to attend funerals or ceremonies, pay for school excursions, or even buy Christmas presents. Aboriginal communities nationally are bearing the brunt of attempts to extend the punitive “income management” regime. In February 2008, Prime Minister Rudd apologized to the Stolen Generations committing the government to, “A future where this Parliament resolves that the injustices of the past must never, never happen again”. But injustices are being perpetuated under the NT Intervention. The paternalism that created “the gap” between the lives of Aboriginal people and the rest of Australia is being fostered by the Intervention and the renewed push for assimilation. The solution to the poverty and disadvantage of Aboriginal communities begins with self-determination – allowing affected communities to decide what programs are needed and how they will be implemented. The Aboriginal Rights Coalition, Sydney, meets every Monday at 6pm @ the Redfern Community Centre. Please come along and join the campaign for justice. If you can’t make the meetings, please consider donating to help the ARC cover our costs. Whether it be travel costs for speakers, photocopying, food or venue hire, the ARC is a volunteer organisation, and depends upon your help to continue. Given that the NTER Review board has finally released its report, it is timely for the various submissions to the NTER Review to be read by the general public. Aboriginal Rights Coalition’s Submission to the Northern Territory Emergency Response Review. National Day of Action: Tell the Review Board what you really think! Comments Off on National Day of Action: Tell the Review Board what you really think! No expansion of racist welfare quarantines! In ongoing action against the NT intervention, people around the country will take action this week against the ongoing injustice of the NT intervention and against its expansion to other areas of the country. The policies of the intervention, which place targeted communities on ‘welfare quarantine’, have dramatically reduced access to food in remote areas. The policies have reduced Aboriginal communities’ right to determine who does and does not enter their lands. Police have been given extraordinary powers to arrest and hold people without charge, as well as powers to enter people’s homes and search without warrants. Compulsory bans on alcohol have put more Aboriginal people in jail, despite all recommendations of the Royal Commission into Black Deaths in Custody, which argue that this should only be used as a last resort. Vince Forrester from NT community of Mutitjulu, has said of the laws, “We are living through Apartheid, we are back to the ration days”. The Rudd government has continued to support these Howard-era policies, despite calls from doctors, social workers and the affected Aboriginal people themselves, to end them and restore the racial discrimination act. On 11am Saturday 27th September, Sydney people will stand together against this intervention and with all others who stand against it. We will also stand against any expansion of these policies to anywhere else in the country — including La Perouse, which has been proposed for welfare quarantining by MP Peter Garrett. Please donate to help us cover the travel costs of community members to get to the Sydney to speak directly about their experiences. The Aboriginal Rights Coalition, Sydney, meets every Monday at 6pm @ the Redfern Community Centre. No welfare quarantining – in NT or elsewhere!